For as long as I can remember, I’ve loved alligators. I think I’ve watched every nature special and read almost every book about them. I’ve visited Gatorland and the St. Augustine Alligator Farm multiple times. I’m even a graduate of the University of Florida, which makes me a Florida Gator. Go Gators! Alligators possess an amazing ability to survive. They’ve outlasted the dinosaurs, come back from near-extinction and managed to thrive living alongside us humans. That reigns as quite an accomplishment in a state as ever-changing as Florida. So what can those of us who are striving to thrive learn from these toothy neighbors? First, we can learn that sometimes we have to move. 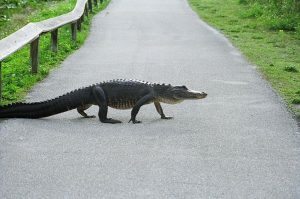 During Florida’s dry season, gators will leave their normal lake and river homes in search of something better. Our news abounds with stories of them taking up residence in swimming pools, back yards, and ponds on golf courses. The trip to their new home is difficult, as alligators were designed for mobility in the water, not land. But they keep moving forward, one lumbering step at a time. In life, we humans often face dry seasons. Grief, anger, bitterness and fear make us feel anchored to a desolate place with no hope of change. We may feel the journey to our more fertile land is too difficult or long. Like the traveling alligators, we must push forward, knowing there is a place far more habitable waiting for us at the end. Second, we can learn to try new strategies to help us move forward from a bad place. Alligators are crafty, adaptable creatures. When water levels in the Florida Everglades fall, the alligators will dig “gator holes.” These fill with water and provide a habitat for other wildlife. These also provide the alligators a steady food source as animals come to the gator holes to drink. Some gators in our state have learned other strategies to aid them in surviving, like how to push through pool screens or how to climb a chain link fence to get to the little dog housed within. Gator’s run on instinct, and when their tiny brains fix on prey, they figure out a way to obtain their desired meal. We often find ourselves in a place where none of our go-to methods work. We feel lost, helpless and weak. We need a new plan. We need to find a way to keep moving forward. At these times, we can turn to God and remember what he tells us in 2 Chronicles 15:7. “But as for you be strong and do not give up, for you will be rewarded.” (New International Version). Alligators don’t rank high on the intelligence scale, but they have managed to persevere far better than most members of the animal kingdom. They don’t give up, they adapt. You can, too. So take care of yourself and keep striving to thrive! What are some ways you’ve discovered that helped you move on from a tough place? Please share in a comment. I’d love to hear from you!